Having a few days off on sick leave at present, but there's really only so much resting & reading one can do!! Every now & then the need to do something cheerful and soothing surfaced ......... like a bit of scrap "therapy" !!!!! So, I have been working on a project I have wanted to try out for some time now. Initially, I had just a rough colour scheme idea. And I needed lots of scrappy hexis, approx. 5" across. The enjoyment today was mostly in the cutting out, rather than in the end product. I have read extensively lately about the "modern" quilt........a new twist on the traditional art of quilting..... may contain reinterpreted traditional blocks...... often use grey & white as neutrals...... frequently use improvisational piecing.......use asymmetry in quilt design...... reflects an increase use of solid fabrics............Years ago when I owned a little patchwork shop the joy of sewing got lost somewhere in amongst the reality of making a living, but now I am simply enjoying all aspects of quilting .......whether it's modern, traditional, or art. Today I took a pic of my attempt a wee while ago at making the "Modern" quilt!!!! After letting chance play a part, I think it's looking ok now. Simplicity & minimalism are the words that spring to mind!!!! The lovely machine quilting has been done by Annette from Wildcotton Ltd and really does add another dimension, especialy in all the -ve spaces. However, I do need to get a wriggle-on to have it all finished completely by 5 August. 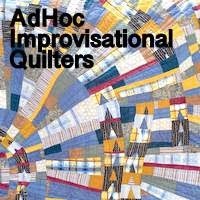 We are handing in our quilts then for the Monday Modern quilt show that's happening mid-September at Highwic House in Parnell. I am wondering about the quilting pattern, but for now will just enjoy looking at it. Sometimes I find if I use the "be patient Linda" button, then inspiration does kinda happen eventually!!! P.S. Anyone joining in the Double Wedding Ring competition? see Kathy's latest blog entry over at Material Obsession. 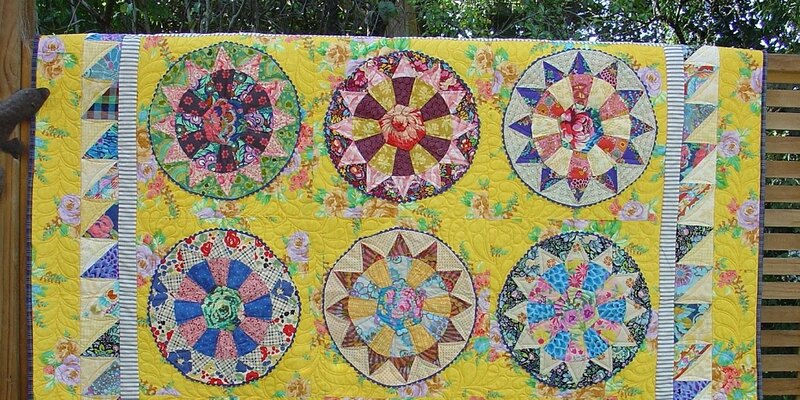 We have just had a lovely couple of sunny days, so I thought I'd air a few quilts. This next quilt was one I made some time ago...using all the sample/random blocks that didn't ever make it into an actual quilt. Amazing what a bit of black & white can do to bring something all together!!! And I quilted it with just straight lines around each block. This quilt was very simple, 2 1/2" x 8 1/2" strips, 10-12 different fabrics to give a good variety, with an ice cream sort of feel. I got the idea from "The Gentle Art of Quiltmaking" by Jane Brocket. And again I just did simple straight line quilting. And this quilt is one I made for my granddaughter - I got the idea from Material Obsession. There were 2 quilts each different, one made by Michelle Marvig and the other by Marg George. I didn't have a pattern so I combined ideas from both, did each part slowly & prayed it all went together in the end!!!! I just found this interesting series by Jess @ http://theelvengarden.blogspot.com.au/ on Colour Theory for Quilters - how quilters approach colour, and where they find inspiration for choosing palettes. If you scroll down there's a good part on value & low volume. I have been busy today making more pastel pinwheels! I need a bit more toile for my final outer border but am not too sure where I will find that??? It's quite an old type of fabric I know & one that I haven't seen around lately! I am working an afternoon shift tonight until 11pm, but before that I'm going to spend the morning sewing a few pinwheel blocks. My Kaffe Fasset "Museum Quilts" book was the starting point for all this renewed interest in the pastel/low volume look! Once there is another row right around of more pinwheel blocks, I am hoping the old toile prints will fade gently into all the other pastel KF prints....however, as I have found lately, I can start out with a vision of where I'm going but it dosen't always end up quite the same!!!!! We shall have to wait & see.